For the record: this post also contains Monte & Coe affiliate links. For years, people everywhere have been plagued by the wants vs. needs phenomenon when it comes to shopping. Throw in the growing exposure to once undiscovered brands, along with fast-fashion retail, and making a shopping decision has never been more challenging. This game-changing formula helps make sense of how to build a wardrobe lined with quality, utility, and trendy items. For example, let’s start with a simple decision to buy a pair of jeans. You are debating between a $200 pair of Selvedge denim or $200 pair of distressed denim, which pair do you buy? 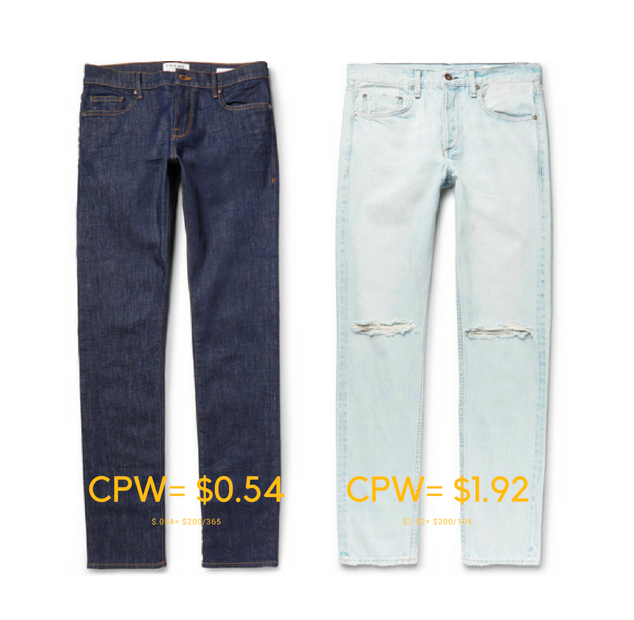 Easy…use the cost per wear method! Here’s the rationalization: A selvedge pair of denim jeans is a closet classic that matches every outfit. You can wear them with a t-shirt, a button up, a hoody…it doesn’t matter. Practically speaking, you could wear them every day, for 365 days straight. In comparison, a distressed pair of denim is not fitting for all scenarios (like casual Friday at work) and has less utility. Let’s presume you could wear them twice a week, or 104 times per year. As you can see above, the decision is easy, especially if you consider that you will likely get more than one year of wear out of the selvedge compared to the distressed denim, which will likely go out of style. This is how you add quality staples to your wardrobe in a cost-effective way. If you want to add on-trend seasonal pieces, make sure you apply the same method. Designers will always put out luxury prints and patterns, but low-cost retailers will soon follow. If it’s something think you will be wearing for a short-time, don’t invest in labels, invest in budget- friendly garments with similar style impact. Above are two floral print shirts, similar in design. 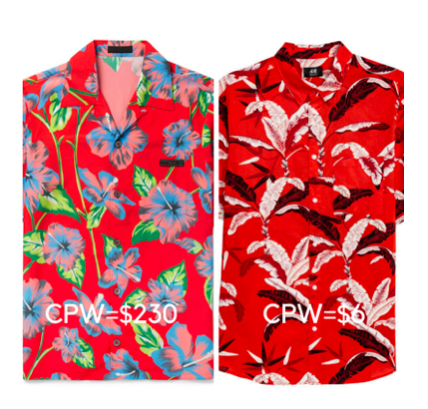 The one on the left is Prada Camp-Collar Printed Voile Shirt priced at $1,150on Mr. Porter, and the one on the right is sold at H&M for $29.99. Both shirts offer an exciting and vibrant summer vibe and make a perfect combination when paired with white pants or shorts. But how many times can you wear a piece so loud and vibrant? My guess would be 3-5 times a summer before your family and friends are tired of seeing the same outfit. So why pay $230 every time you wear a shirt, when you get the same style points for $6? Looking for a weekender bag that you can use to go to the gym, take on a weekend road trip, and travel across the globe on your 3-week vacation? Apply the same method, but, with accessories, remember that a good investment should last 5 years, at the very least. Don’t cheap out here, because if you plan on getting maximum use out of your purchase, than the $100 option won’t make the journey. Instead, look for something with durable materials like our very own Ossington weekender which features a strong Italian wool and Full Grain Italian Leather. It’s also handmade, which means the quality & craftsmanship is guaranteed to handle what you need of it. Spend your money on items with the most usage and long-term value and use the discount and fast-fashion retailers to layer your closet with seasonal, short-term trending items. Andrew Coelho is the co-founder of Monte & Coe, a Canadian lifestyle brand that creates bags and accessories using premium wool and leather sourced from Italy. Their mission is to elevate traditional products with a fashion-forward perspective while being as eco-conscious and socially responsible as possible. All of their products are handmade in Canada by expert craftsman who work in fair-wage, labor-friendly environments. You can learn more about what they have to offer here: Monte & Coe.